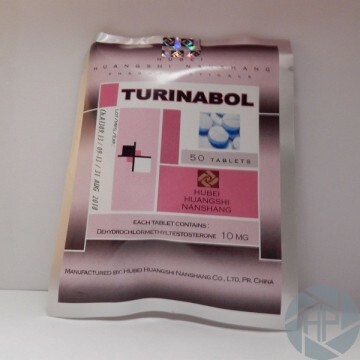 Oral-Turinabol has a predominantly anabolic effect which is combined with a relatively low androgenic component. On a scale of 1 to 100, the androgenic effect of Oral-Turinabol is very low -only a 6- and the anabolic effect is 53. (In comparison: the androgenic effect of Dianabol is 45, and its anabolic effect is 90.) Oral-Turinabol thus has milligramme for milligramme a lower effect than Dianabol. It is therefore not a steroid that causes a rapid gain in strength, weight, and muscle mass. Rather, the achievable results manifest themselves in a solid muscle gain and, if taken over several weeks, also in a good strength gain. The athlete will certainly not get a puffy look as is the case with Testosterone, Dianabol, and Anadrol 50. The maximum blood concentration of Oral-Turinabol when taking 10, 20 or 40 mg/day is 1.5 -3.5 or 4.5 times the endogenous testosterone concentration (also see Dianabol). This clearly shows that the effectiveness of this compound strongly depends on the dosage. An athlete weighing 200 pounds would take only 4 tablets of 5 mg (20mg/day.) In our experience bodybuilders take 8-10 tablets of 5 mg, that is 40-50 mg/day. Many enthusiastically report good results with this dosage: one builds a solid muscle mass, the strength gain is worthwhile seeing, the water retention is very low, and the estrogen caused side effects are rare. Not without good reason, OT is also popular among powerlifters and weightlifters who appreciate these characteristics. Due to its characteristics, OT is also a suitable steroid both for men and women in competitions. A usually very effective stack for male bodybuilders consists of 50 mg OT/day, 228 mg Parabolan/week, and 150 mg Winstrol Depot/week. Those who have brought their body fat content to a low level by dieting and by using fat burning substances (e.g. Clenbuterol, Ephedrine, Salbutamol, Cytomel, Triacana), will find that the above steroid combination will manifest itself in hard, sharply defined but still dense and full muscles. No enlarged breasts, no estrogen surplus, and no watery, puffy looking muscle system. If Oral-Turinabol were available on the U.S. black market for steroids, bodybuilders, powerlifters, and weightlifters would go crazy for this East German anabolic. The potential side effects of OT usually depend on the dosage level and are gender-specific. In women, based on their predisposition, the usual virilization symptoms occur and increase when dosages of more than 20 mg per day are taken over a prolonged time. In men, the already discussed reduced testosterone production can rarely be avoided. Gynecomastia rarely occurs with OT Since the response of the water and electrolyte household is not overly dis-tinct athletes only rarely report water retention and high blood pressure. Acne, gastrointestinal pain, and uncontrolled aggressive behaviour are also the exception rather than the rule with OT An increased libido is reported in most cases by both sexes. Since the substance chlordehydromethyltestosterone is I 7-alpha alkylated the manufacturer in its package insert recommends that the liver function is checked regularly since it can be negatively affected by high dosages and the risk of possible liver damage cannot be excluded. Thus OT is also a steroid that can be taken without interruption for long intervals. Studies of male athletes who over a period of six weeks were given 10 mg OT/day did not show any indications of health-threatening effects.